LMBM is a limited memory bundle method for general, possible nonconvex, nonsmooth (nondifferentiable) large-scale minimization. Both the unconsrained version of the method and the version for bound constrained problems are available. You can also use the code LDGB as Fortran 95 version of LMBM (unconstrained case). Due to some implementational facts it might use less subgradient evaluations than the version here. The software is free for academic teaching and research purposes but I ask you to refer at least one of the references given below if you use it. - testprogram for limited memory bundle method. - limited memory bundle method. - subroutines for limited memory bundle method. - matrix and vector calculus. - large-scale nonsmooth test problems. - MatLab (mex) driver for LMBM by Seppo Pulkkinen. N. Karmitsa, "LMBM — FORTRAN Subroutines for Large-Scale Nonsmooth Minimization: User's Manual", TUCS Technical Report, No. 856, Turku Centre for Computer Science, Turku, 2007. N. Haarala, K. Miettinen, M. M. Mäkelä, "Globally Convergent Limited Memory Bundle Method for Large-Scale Nonsmooth Optimization" (author version), Mathematical Programming, Vol. 109, No. 1, 2007, 181-205. The original publication is available online at www.springerlink.com. 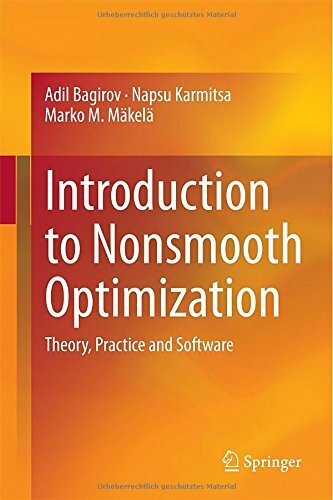 M. Haarala, K. Miettinen, M. M. Mäkelä, "New Limited Memory Bundle Method for Large-Scale Nonsmooth Optimization" (author version), Optimization Methods and Software, Vol. 19, No. 6, 2004, 673-692. The original publication is available online at http://journalsonline.tandf.co.uk. M. Haarala, "Large-Scale Nonsmooth Optimization: Variable Metric Bundle Method with Limited Memory", Doctoral Thesis, Department of Mathematical Information Technology, University of Jyväskylä, Jyväskylä, 2004.
tlmbmb.f - testprogram for LMBM-B. lmbmbs.f - subroutines for LMBM-B. matca2.f - matrix and vector calculus. - large-scale bound constrained nonsmooth test problems. - older version of LMBM-B in compressed form. This version in not necessary globally convergent. However, in practice, it sometimes works better than the globally convergent version. N. Karmitsa, M. M. Mäkelä, "Limited Memory Bundle Method for Large Bound Constrained Nonsmooth Optimization: Convergence Analysis" (author version), Optimization Methods and Software, Vol. 25, No. 6, pp. 895-916, 2010. The original publication is available online at http://informaworld.com. N. Karmitsa, M. M. Mäkelä, "Adaptive Limited Memory Bundle Method for Bound Constrained Large-Scale Nonsmooth Optimization" (author version), Optimization: A Journal of Mathematical Programming and Operations Research, Vol. 59, No. 6, pp. 945-962, 2010. The original publication is available online at http://informaworld.com. - large unconstrained nonsmooth minimization problems. - large bound constrained nonsmooth minimization problems. - large inequality constrained nonsmooth minimization problems. - some more test problems. M. Haarala, K. Miettinen, M. M. Mäkelä, "New Limited Memory Bundle Method for Large-Scale Nonsmooth Optimization" (author version), Optimization Methods and Software, Vol. 19, No. 6, 2004, 673-692 (only the unconstrained problems). The original publication is available online at http://journalsonline.tandf.co.uk. N. Karmitsa, "Test Problems for Large-Scale Nonsmooth Minimization", Reports of the Department of Mathematical Information Technology, Series B, Scientific computing, No. B 4/2007, University of Jyväskylä, Jyväskylä, 2007. I would like to thank Prof. Marko M. Mäkelä (University of Turku, Finland), Prof. Kaisa Miettinen (University of Jyväskylä, Finland), and Prof. Ladislav Luksan (Academy of Sciences of the Czech Republic).